Moorea-based match officials Oito Pari and Norbert Hauata during the OFC Elite Referees Seminar. The OFC Elite Referee Seminar held in Tahiti in the lead-up to the OFC U-19 Championship has proven to be a blessing in disguise for Moorea-based Oito Pari. The assistant referee was offered the opportunity to join Oceania’s leading match officials as a guest of the Federation Tahitienne de Football, and his participation in the seminar has led to a call-up to join them for the regional youth tournament which kicks off today. “Normally I was just going to be involved in the course but Charles Ariiotima, the Director of Competitions for FTF, told me I could participate in the competition. “I said ‘of course!’. I’m so happy,” Pari said. OFC Referee Development Officer Kevin Stoltenkamp led the three-day seminar, which concluded on Saturday, and has been pleased with the commitment shown by all 18 of the participants. “We invited all of our FIFA referees as this is regarded as an elite seminar. However the guys who were at the World Cup have been given time off,” Stoltenkamp said. The seminar was aimed at equipping the match officials with the latest trends in regards to decision-making and Laws of the Game, and was also used as an opportunity to prepare the match officials for the OFC U-19 Championship, and the upcoming OFC U-16 Championship. Stoltenkamp has been particularly pleased with how the group has come together as a team during sessions which included two hours of classroom preparation followed by three hours of practical sessions, putting in place what they learned in the morning session. “You can see in that they’re pushing each other, they’re very competitive on and off the field which is really good,” Stoltenkamp explained. As for the addition of Pari to the team of officials for the U-19 tournament, Stoltenkamp said it was an easy decision for him based on the performances he had seen throughout the seminar. “We’ve been very fortunate in that we extended the invitation to FTF and they opted to send two match officials to join us. “The first day they were a bit nervous but fortunately Norbert Hauata made them feel welcome and as a result of us needing one more official, and based on his performance, Pari has been invited to participate in the tournament,” he said. 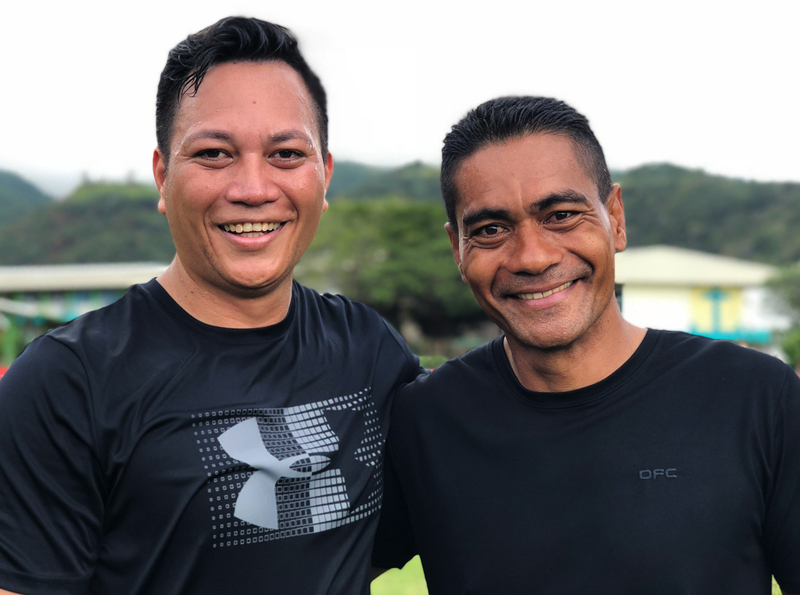 Tahiti’s leading referee Hauata has known Pari for some time and is delighted to now only have had him join in on the seminar, but now earn an appointment to the OFC U-19 Championship on home soil. “It’s great to have had them on the course, to have them join the elite referees,” Hauata said. “And who wouldn’t be happy to be in this competition? But this is a big honour for him, also for us especially, having a second match official from Moorea. I’m proud of him for this big chance. Hauata has relished being back at home after a successful gig at the FIFA World Cup Russia™, which was his second World Cup appointment after Brazil 2014. One reason he was keen to take part in the seminar was being able to share the learnings from this latest event with his colleagues from across Oceania. “For us also, we can share our experience not only with these referees from Moorea but with our friends from the islands like Vanuatu, Solomon Islands, Papua New Guinea. “We are here to learn every day, that’s our target – to share our experience. I am very happy to share everything I get from the FIFA World Cup, I’m here to share with everyone. “I wasn’t supposed to be here, but it’s a big honour for me to go from Russia to here. From Russia to giving my experience to friends. It’s a big honour and a dream come true,” Hauata concluded.